We admire dancers and acrobats as they perform feats of balance against gravity that require concentration and mastery. And the knowing between our own needs and the needs of others is a lifelong pursuit of psychological balance that we as humans endeavor to achieve throughout all the stages of our life. Such psychological balance is most acutely learned in infancy and childhood since we, as humans, share a profound dependency on our caregivers for a long time (18 years). That dependency in early infancy transmutes into a beautiful process of interdependency as a child matures when caregivers model a profound curiosity in the child through emotional resonance. Emotional resonance is the “music” of love and caring. The child absorbs this delight and curiosity and owns it as his or her own sense of self as it matures into adulthood. In adulthood, one continues this delight and curiosity towards self and others without much strife. Emotional resonance is the music of love and caring that allows for a healthy balance between one’s needs and the needs of others. The mastery of psychological balance is a most important task of mastery undertaken in childhood continually pursued in adulthood thorough a continued skill in emotional resonance. In adulthood, such a mastery is very often the prerequisite to a successful marriage and to successful social relationships whether in friendships or work relationships. If such emotional resonance was lacking in childhood, it can be taught again later in life by a caring spouse and in a therapeutic encounter where the client learns to value self through a sense of emotional resonance in the experience with the therapist. I tune in into my client’s emotional experience and in doing so, I connect with unmet needs. My client and I form a bond where I get to probe and ‘translate’ the emotional language of the unmet needs through the eyes of the child. In that process, an experience will bubble up and the very verbal expression of that experience allows balance between sensations and emotions to take root. That attunement will sometimes lead the client to re-experience painful memories through the eyes of understanding held in the therapist mind and heart. And so balance is achieved. The promise of emotional repair through emotional resonance with a trusted other is hopeful. It allows for one to experience the music of love and caring even in adulthood. 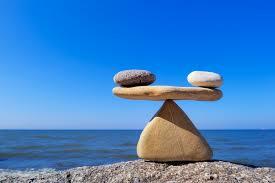 It is never too late to learn the lesson of psychological balance. Every human deserves the gift of such lesson.